We came to Fuzhou for a celebration. Celebrating 20 years is a big deal in China. As you might imagine, it's unusual for a U.S. nonprofit to have been in China for this length of time. The big celebration was held in our hotel, which I think is the nicest hotel in Fuzhou. Many top folks from around the country came for an all-morning event with more than a dozen speakers. They included representatives from different schools from around the country, the U.S. Counsel General, a Vice President from the Disabled Persons Federation and a delegation from Hong Kong. 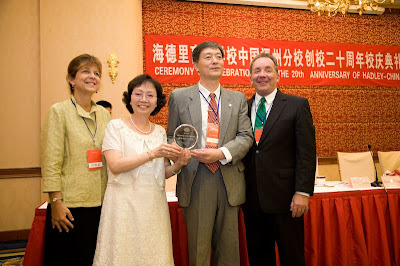 A lot of this was celebrating the achievements of Mr. Xia Rongqiang (Chester), the founder and principal of Hadley China. The main curriculum at Hadley China is around teaching English. 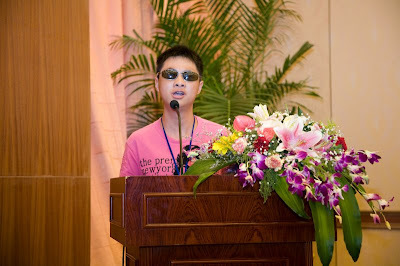 One of my favorite speakers was a young Hadley student who was quite talented and appealing. As we went around the country, we kept running into former Hadley students and teachers. 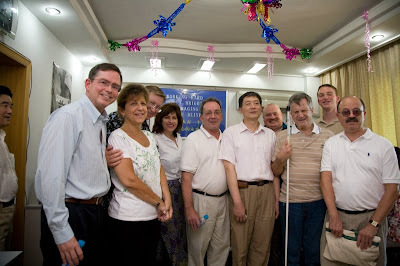 It's clear Hadley has had a great impact on the blindness field in China. 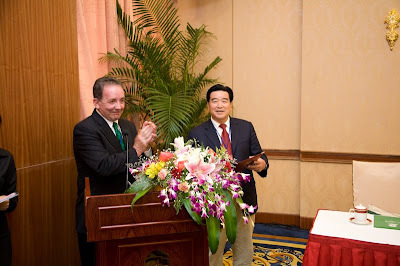 Part of the meeting was celebrating the first ever China Hadley director and donor, Mr. Zhang Zhongyan. Even though he didn't speak English (or more accurately, we didn't speak Mandarin), he was a lot of fun to have a few beers with. After the official celebration, we trooped over to the Hadley China offices. Since it's a distance education school, and all of the students and most of the teachers work remotely, it's quite a small office. But, we were all able to pack in!